After three seasons, Gotham finally is going to give us some actual Batman action. Gotham season 4 airs next month and Fox has just released a new promo for the upcoming season which gives us a whole lot of villains, darkness and action in Gotham City. But most importantly, we finally see Bruce Wayne put on the Batsuit. Granted, it is a very early version, but it is finally happening and Gotham is becoming the show that it was always destined to be. The new trailer was uploaded to the Gotham YouTube channel and gives us possibly our best taste of season 4 so far. It is fast paced and everything moves by in the blink of an eye, but there is a lot crammed into the short trailer. For one, we get a look at Scarecrow, who is going to be a menace to the city in Gotham season 4. But who is going to stop the famed DC villain? Well, based on this trailer, it looks like Bruce is going to suit up and take out some of the city's bad guys on his own. Finally. 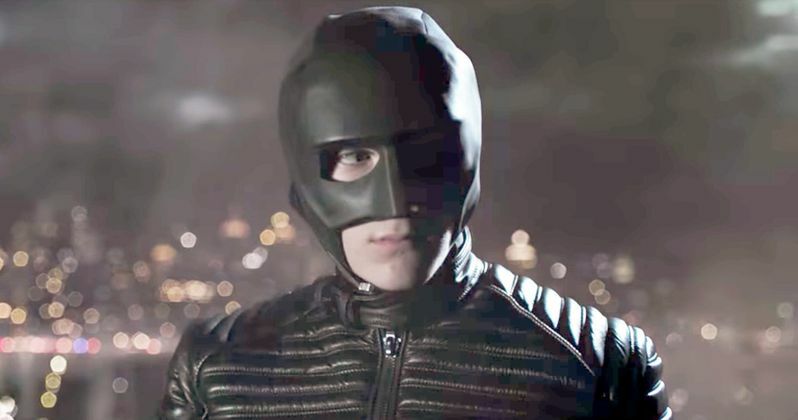 At the very end of the trailer, we see David Mazouz's Bruce Wayne in a pretty heavy duty jacket that looks like it could absorb some punishment, but the real excitement comes when he puts on a primitive looking version of the Batman cowl. This is the first time we've seen the character suit up in any form on Gotham, so it is nothing shy of a big deal. Gotham season 3 finale ended with Bruce Wayne taking out some muggers and left us with the promise that Batman is on his way to Gotham City. This trailer delivers on that promise. Granted, this isn't full-on Batman with the cape and the imagery we're all familiar with, but the show is clearly headed in that direction. Over the years, Gotham has brought us a ton of Batman's rogues gallery of villains, many of whom appear in this new trailer. Penguin, Riddler and Poison Ivy, among others, are all teased here and are running the city. At some point, someone has to help Jim Gordon clean up the streets and it looks like David Mazouz is finally going to become the hero the city needs right now. Even the Gotham season 4 subtitle, "A Dark Knight," that is teased at the end of this trailer promises Batman is imminent. Gotham season 4 is going to be moving to Thursdays on Fox this season, so plan your viewing accordingly. The new season is slated to premiere on September 21 and by the looks of things, DC fans are going to want to tune in this season. It's been a long journey, but this show could really hit its stride this season and give us some Batman: Year One kind of action. Be sure to check out the new trailer for Gotham season 4 for yourself below.